Over the weekend, the California School Boards Association presented 56 Golden Bell Awards to winners from across the state, 10 belonging to Orange County recipients. Innovative programs in the Newport-Mesa Unified, Fullerton Joint Union High, Fullerton, La Habra City Elementary, Cypress Elementary and Westminster school districts, as well as the Orange County Department of Education, received their awards on Dec. 3 at CSBA’s Annual Education Conference and Trade Show in San Francisco. Now in its 37th year, the Golden Bell Award is considered one of the state’s leading educational honors, recognizing public school programs that are inventive and sustainable, make a demonstrated difference for students, and focus on meeting the needs of all students. Experts from school districts and county offices of education comprised a 16-member judging panel that reviewed and awarded in 19 categories. Since 2010, The Gift of History Program has engaged over 85,000 students from 34 cities across Orange County. It is a multi-agency partnership led by the Children’s Education Foundation of Orange County, Orange County Department of Education, and over 20 corporate, government and community agencies. The program is offered at no cost and includes three main components: 1) every third-grader in Orange County receives a copy of the Nothing Rhymes with Orange book, which explores the county’s history from dinosaurs to the present; 2) teachers receive an eight-week companion curriculum aligned with the third grade California State Standards; and 3) students are invited to a capstone event where history comes alive during a spectacular one-hour lesson. The program creates civic pride, builds 21st Century skills, and promotes community engagement. While site administrators, district leaders and board members have access to more performance data than ever before, too often they are overwhelmed by the complexities of the collection and display of the information and are unable to use it strategically to make important decisions that impact the lives of students they serve. Newport-Mesa Unified School District has taken a huge leap forward in the field of dynamic data displays that offer real time, interactive visualizations of the most important data district leaders need to make critical and timely decisions. Newport-Mesa Unified School District has also combined effective processes to use the data dashboards in meetings with principals, site leaders, and even board members who crave this level of meaningful information. The Newport-Mesa Bus in the Classroom program teaches transportation safety and life skills to students with special needs. It also helps redefine the traditional role of transporters to be actual educators rather than just supporters of the educational process. Bus drivers and transportation office staff literally bring the bus to the classroom to teach these crucial lessons. In the process, they build relationships, their own skills, and more successful students. Students as young as three and as old as 22 have learned skills that make them immediately safer, but because the program is fun and engaging, students are eager to continue to learn. The program is designed to be taught early and often to develop safety and independence habits. In 2001 the Newport-Mesa Unified School District seized an opportunity to expand mental health services to meet the needs of both general and special education students districtwide. The Psychological Support Services (PSS) Program was created to provide a comprehensive multi-tiered mental health program utilizing district staff and community partnerships. In the five years since, the district has seen an increase in the number of students receiving mental health support from 59 students in 2011 to over 450 students in 2016. As one of the first districts in Orange County to adopt a school-based mental health program, the Newport-Mesa Unified School District has provided program development and support to many other districts creating a program. The Highlander Student Targeted Enrichment Program (HiSTEP) is a school-wide proactive intervention program focused on providing academic support, closing the achievement gap, and increasing and rewarding academic success. HiSTEP provides peer-mentoring for ninth grade students through HiSTEP Freshman Focus, individualized academic support for struggling students through HiSTEP Tutorial and Study Hall, and an incentive and reward system for students meeting all academic, attendance and discipline standards through HiSTEP Long Lunch. 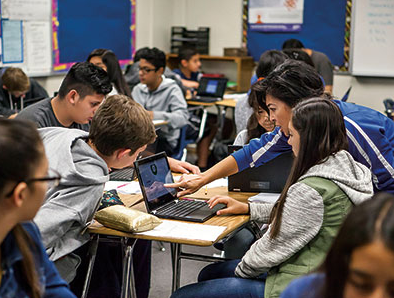 Since its implementation, La Habra High School has decreased the course failure rate among all lower performing subgroups and met Adequate Yearly Progress (AYP) two years in a row. HiSTEP has fostered a culture that highly values the academic strengths of their students and provides timely intervention for those who need additional support. In June 2009, the Board of Trustees of the Fullerton Joint Union High School District established the La Sierra High School Adult Transition Program. Disabled adults have an 83 percent unemployment rate and a dissatisfaction rate with the quality of their life which is 70 percent higher than non-disabled adults, according to the U.S. Department of Labor. The Fullerton Joint Union High School District strives to combat those statistics by providing a rich, community-based curriculum of vocational, mobility, independent-living and recreational training to these students. Students are placed into classrooms or hubs close to their residence so they can learn to ride the bus, shop, eat out, get a haircut, and work close to their homes. The Ladera Vista UACRE Program supports scientific knowledge through sustainable agricultural practices and cross-curricular connections for hundreds of students through hands-on experiences in its beautiful garden and in classrooms across campus. Students start with seeds from the Native American Heirloom Seed Bank. They track the growth of their seedlings using a custom-designed iPad app, and utilize data gathered through the app in science classrooms. Students learn about the historical and cultural significance of their crops in history classes. Best of all, crops grown in the UACRE garden find their way into their culinary arts classrooms, where students learn to prepare ancient grains and other foods grown in their garden. The Readiness Building Blocks program is a free program designed to expose pre-kindergarten aged children and their families to the 21st Century Learning Framework by learning about their community and interacting with community members in the real-world classroom. Students have the opportunity to connect with their community by visiting key businesses and agencies such as a bank, supermarket, police and fire department, a farm and more. The program is designed to reinforce the learning that is taking place in the classroom in regards to the 21st Century Skills of Collaboration, Communication, Critical Thinking, and Creativity. Children and their families are thoroughly engaged as members of the community teach the importance of teamwork, interact effectively with coworkers and other agencies, and find creative solutions to the challenges of today. In the fall, an education specialist and two speech-language pathologists at Vessels Elementary School came together to discuss evidenced-based methods of support for a small subset of students in a regional autism program. These students typically demonstrate the slowest mastery of Common Core State Standards and Individualized Educational Plan goals, and include those with no verbal language who use augmentative and alternative communication systems to communicate, those with significantly reduced language abilities, and children who speak at the phrase level, but are impacted significantly by behavioral challenges. The team searched for an existing research-based curriculum, but being unable to find one, created a multifaceted intervention. This program incorporates input from paraeducators as valuable and informed members of the implementation team, a partnership that has also been shown to support an evidence-based approach. Westminster School District teachers have transformed their teaching and changed the way students learn with the i4 Blended Learning Academy. I4 stands for inspire, innovate, implement and impact. Dedicated, creative TK-8 teachers have taken giant strides to transition their classrooms into a blended learning environment. These i4 Innovators are well equipped with ongoing professional development, embedded coaching, and effective online and traditional classroom resources to support personalized learning for students. Collaboratively with their Educational Technology Coach, i4 Innovators have discovered innovative practices and provided students with new learning experiences. The i4 Innovators have empowered their students to work collaboratively and independently in blended learning environments with the Chromebooks and online tools; this program has allowed students to engage in dynamic learning experiences across a range of modalities.